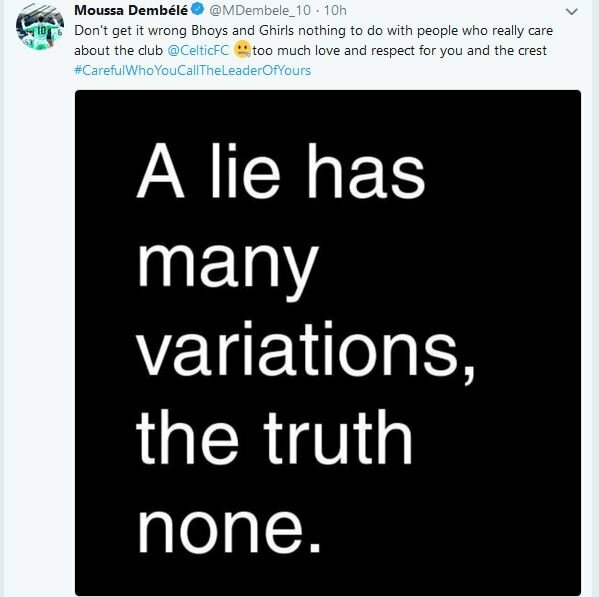 Celtic striker Moussa Dembele has tweeted a cryptic message that appears to criticise manager Brendan Rodgers and the club’s hierarchy, and the Bhoys must look to sell him before Friday’s deadline and make an ambitious loan swoop for Paris Saint-Germain youngster Timothy Weah to replace him. Well, Dembele has been heavily linked with a move away from Celtic Park in recent days and weeks, but Rodgers suggested on Thursday night that the Frenchman would be staying with the Scottish Premiership holders amid interest in him from clubs in his home country. The 22-year-old has since taken to his social media account to tweet a message that appears to hit out at the club either for failed promises or not allowing him to leave before the deadline, which surely won’t go down well with Rodgers and even some of the team’s fans as well. What should Celtic do next? Even though they would obviously like to keep a player who has scored 51 goals in 94 appearances for them, perhaps they would be better off cashing in on him now given he is clearly unhappy. Of course, the Bhoys should not do that unless they definitely have a replacement lined up, and they must make an ambitious bid to bring highly-rated PSG attacker Weah to Scotland. The son of Liberia legend George, the talented 18-year-old was one of the Ligue 1 giants’ standout players during pre-season, and he has already scored two goals in three first-team appearances for them this term. While that suggests he could have a key role to play, competing with teammates like Neymar and Edinson Cavani for a starting spot in the future means his game time is likely to be limited this term, and a loan move to a club like Celtic – where he would likely hit the ground running in the Premiership – would perhaps be beneficial for all parties in terms of his development.